Starts tomorrow and we’ll be watching as France confronts Uruguay at 8:30pm. 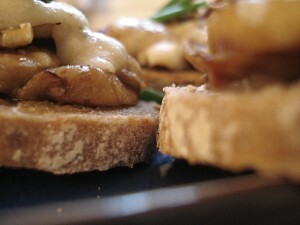 I’m thinking of yummy munchies and of making some of my mushroom bruschetta. This has been a longtime favorite, but I most recently tried it on hearty slices of dark seedless rye bread from the local boulangerie. Yum, yum. Don’t think I’ll change a thing for tomorrow’s cheering session. 1. Sautée the garlic in a bit of olive oil. Add the sliced mushrooms after a few minutes and fully cook. Add salt and pepper to taste. 2. Rub the edges of the slices of bread with a garlic clove. 3. Spoon the mushrooms onto the bread and cover with the Parmesan shavings (to make: use a vegetable peeler). 4. Grill in a hot oven until the cheese is melted and beginning to turn brown. 5. Decorate with a splash of pepper and fresh chives. *I’d recommend baby portobello or good old champignons de paris. This entry was posted in Recipes (All) and tagged appetizers, vegetables. Bookmark the permalink. I am not certain where you’re getting your information, however good topic.